An ROP protein bound to a GDP molecule. The areas colored in pink indicate where the fat molecule binds: image via Tel Aviv UniversityTel Aviv University researchers have discovered a cellular process in plants that encourages growth of new cells. They have manipulated this process in a laboratory setting and have found that is very similar to a mechanism that takes place in the human body, one that can encourage growth of cancer cells. 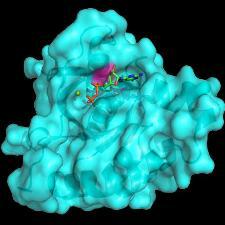 The process involves a fat molecule that modulates proteins called ROPs. When the ROPs bind to the fat molecule, what the researchers call the 'switch,' the ROPs 'turn on,' growing new tissues and responding to bacteria and viral invaders. Humans have protein cells similar to ROPs: they are cells in our immune system and can fight disease or send chemical messages to cancer cells, telling them to spread disease. Understanding the plant switch and having learned how to manipulate the plant ROPs in the laboratory, the researchers believe they are very close to the ability to turn the switch off in the human equivalents of ROPs, thereby preventing tumor growth. "We've stumbled upon an ancient mechanism that regulates the function of these proteins, proteins which are found in both plants and humans," says Prof. Shaul Yalovsky, lead researcher of the ROB study, published in the June 5, 2010 issue of Current Biology. "When these proteins are turned 'on,' they can initiate processes like cell division and growth," says Prof. Yalovsky. "Through our genetic engineering, these proteins could be manipulated in humans to speed up tissue healing, or turned off to slow or stop the growth of tumors." Twilight's New Moon & Social Media, America's New Stimulus Plan? Bake And Serve; The Cake Is Pre-Cut!